NCrunch Forum » General Support » Daily Usage Issues » Engine not prioritizing ExclusivelyUses tests before non ditos? Engine not prioritizing ExclusivelyUses tests before non ditos? Hi, I was curious if NCrunch has some logic of prioritizing tests with exclusively used resource, before tests without it? 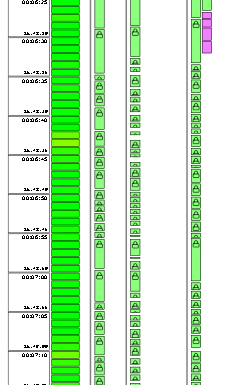 In my scenario I have a lot of db integration tests (exclusively uses "Database"), and "logically" I would expect that 1 core on each grid node focuses on these long running tests, and let the other available core(s) execute the non exclusively uses tests in order to optimize the throughput. In my scenario the nodes are at the end only using 1 core each since all of them are busy with running the database tests. Se below pictures for example, thanks. Right now there is no special consideration for ExclusivelyUsed resources when prioritising tests under the console tool. However, given that such a consideration would very likely give a boost to throughput in almost all situations, I feel that this would be worth adding. We'll see what we can do.